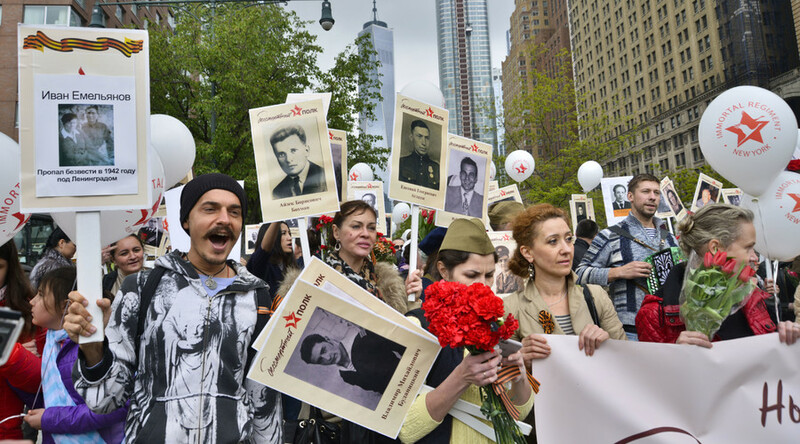 The “Immortal regiment” movement has spread from Russia to cities worldwide, with thousands of people in 42 countries across the globe already marching or getting ready to march in commemoration of their loved ones who fought in World War Two. The marches, which are taking place from May 7 through May 9, are an act of admiration and remembrance of all those who showed bravery during perhaps the most terrifying time in our recent history. They serve to show that each person who died or suffered in World War II was someone’s family, someone’s loved one. 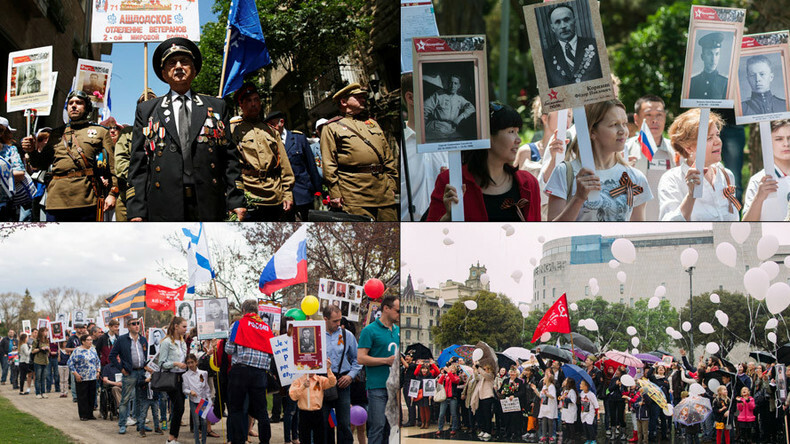 Since its inception in 2007, the Immortal Regiment initiative has been met with unprecedented support, and by 2015 it had received national status. Last year it was held in seven other countries in post-Soviet space and Europe for the first time. This year’s map of the Regiment movement, however, is unprecedented. It will be held in London, Berlin, Kiev, and Astana. The Regiment will march through Tajikistan, Austria, Latvia, Estonia, Malta, Kyrgyzstan, and Kazakhstan. Even in Switzerland, where people voted against a mass march passing through the streets, an online “parade” will be held, and, of course, in Moscow and all of the Russian regions, millions are expected to show up for the Regiment march on May 9. 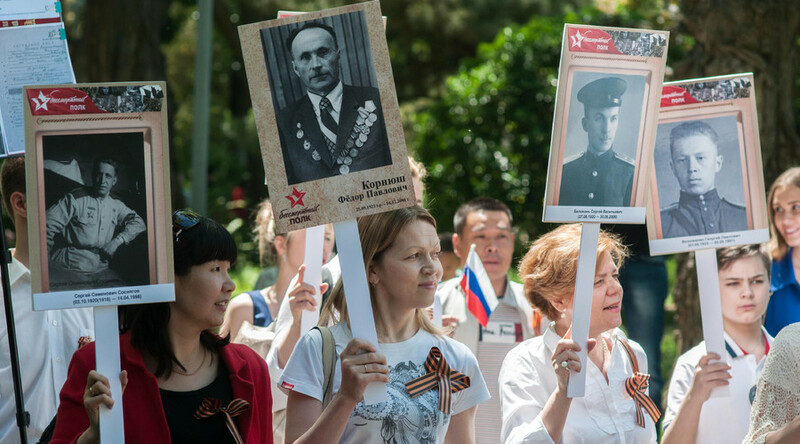 In a number of countries, the Immortal Regiment has already marched, joined mostly by members of the Russian-speaking community, as well as the locals. Some 700 people took part in Prague’s first Immortal Regiment march. They sung the most popular Russian war songs, Katyusha and Smuglyanka, and wore the orange-and-black striped ribbons of St. George, which stand for the Soviet Union’s contribution to the allied victory in World War II. The daughter of Czechoslovakia’s ex-president and acclaimed World War II hero, Ludvigh Svoboda, took part in the event, which was held in Gradchyany, Prague’s historic district. 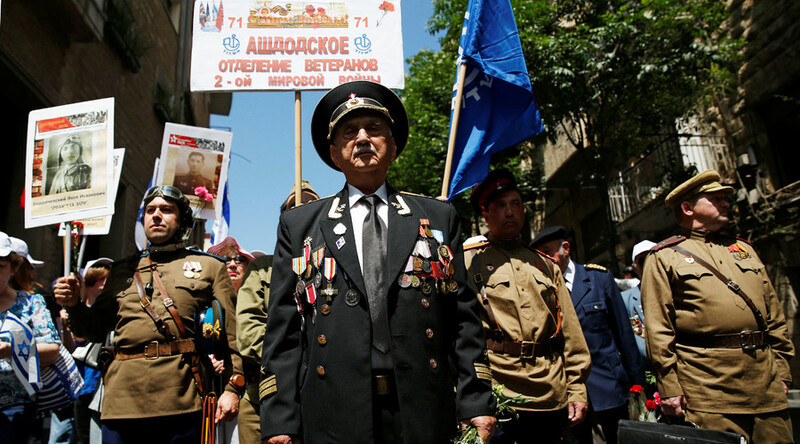 An annual Veterans’ parade was joined by participants of the Immortal Regiment, with some 3,000 people marching through Toronto, according to reports. Montreal also hosted the Regiment march earlier today. The event was held in Moldova for the second time, on the day of Saint George the Conqueror. The parade ended with a concert, where songs and waltzes from the World War II era greeted the marchers. Chisinau is to hold two Immortal Regiment parades this year – the second and bigger one is to take place on May 9. Madrid has hosted its first Immortal Regiment march, with some 200 people taking part. Apart from World War II veterans, the participants of Madrid’s event also remembered those who died in Spain’s Civil War from 1936 to 1939. The mass event, organized by the regional association of Russian expatriates in Spain with the support of the Russian Embassy, will also take place in Barcelona, San Sebastian, and Altea. The capital of China hosted the event for the first time this year. The assembly was not large, as any gathering of over 50 people is considered a rally in the country. Still, with the authorities’ approval, people gathered in a small park near the Russian embassy and shared their families’ wartime stories. The war in China was still far from over on May 9. The families of veterans in both Russia and China do not tend to separate those victories, however. Rome became the first city in Italy to host the Immortal Regiment march. Some 300 people took part in the event, which is also scheduled to take place in several other Italian cities. A march along the quays of Brisbane and a colorful automobile parade took place in this Australian city, with those too old and fragile to endure the walking pushed in wheelchairs. For the third year in a row, the Israelis are among the most active participants in the Immortal Regiment movement. Some 1,500 people marched through Jerusalem, where the Regiment was joined by war veterans. The southern city of Ashdod also hosted the event, with 11 more cities still to host their own. Some 200 people took part in the event for the second time since last year, despite the uneasy situation in this Middle Eastern country. In addition, activists from the youth organization KARIL have been giving out St. George ribbons at Beirut’s universities since April 23, spreading knowledge of the scariest war of the 20th century, with lectures dedicated to the victory over fascism planned for May 9. The Immortal Regiment has passed through the capital of France, with hundreds of veterans, diplomats, Russian guests, and French nationals marching from the Place de la Bastille to Pere Lachaise cemetery, where they laid flowers before the monument dedicated to the Russian heroes of the Resistance. Similar events are also to take place today in Strasbourg, Nice and Montpellier. Six cities hosted the Immortal Regiment parade in the US, and the event is also scheduled to be held in the country’ capital on May 9. The biggest procession gathered in New York, where over 500 descendants of Soviet and American war heroes sung wartime songs and hymns while marching along the Hudson River. They released several hundred white balloons adorned with the images of cranes into the sky, symbolizing the deceased warriors. 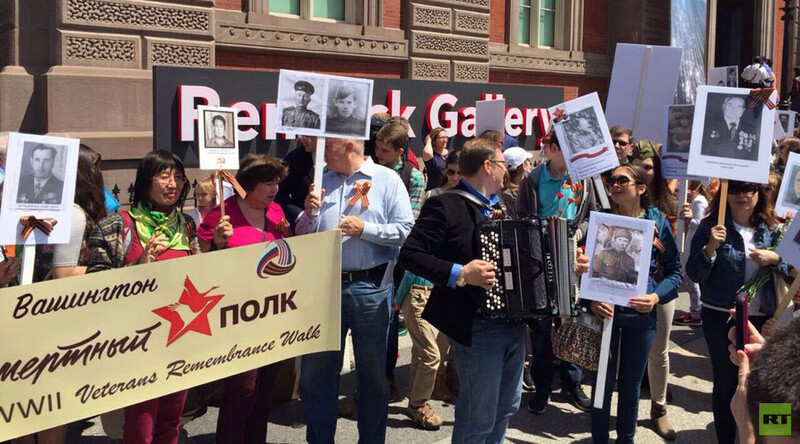 The Immortal Regiment March has also been held in Washington DC, the US capital. Chicago, Orlando, Seattle, Denver, and Houston also hosted the event. Some 300 people took part in the Immortal Regiment parade here, according to the event organizers. Austrians and Russians who live in the country marched to the Heroes’ Monument of the Red Army, where they laid flowers in memory of the anniversary of victory over Nazi Germany. One of Vienna’s liberators, veteran Vladimir Raspolykhin, led the march. 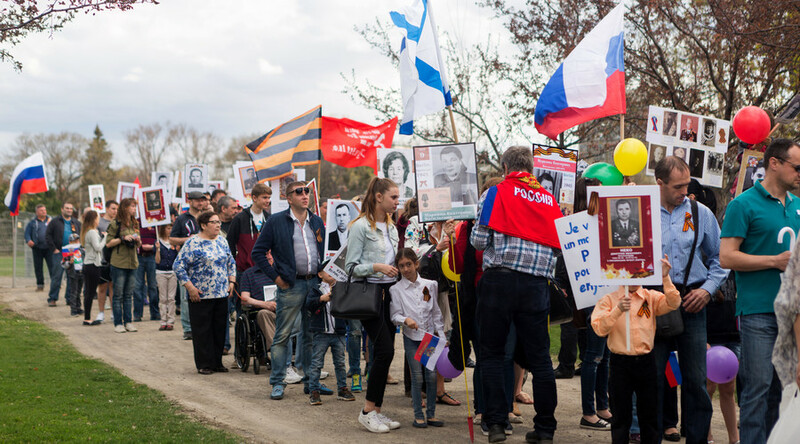 The Immortal Regiment has also paraded through Sweden’ capital once again, with dozens of people marching in commemoration of their lost loved ones. It kicked off with a gratitude mass at the Church of Sergius of Radonezh, and then the “small Swede regiment,” as one of the participants lovingly named it, marched through the streets of Stockholm, shared family stories, and ate some plain army mush. The first Immortal Regiment March was held here last year. South Korean capital Seoul hosted its first Immortal Regiment parade last year. This year the initiative drew twice as many participants, according to the organizers. Dozens also marched through the heart of Buenos Aires, Argentina, joining the global commemoration for the first time. Reports say the March drew a great deal of interest from the locals, who joined in and asked for more information about the event and its purpose.